To Cite: Peseux M, Muzic J, Bouhaddi M, Menetrier A. Changes in Tissue Oxygen Saturation with Well- and Tight-Fitted Compression Sleeves During an Incremental Exercise on Treadmill, Asian J Sports Med. 2017 ; 8(4):e13949. doi: 10.5812/asjsm.13949. Background: Effects of lower-limb compression garments on hemodynamics during walking or running remain unclear. Objectives: The purpose was to examine the changes in tissue oxygen saturation (StO2) with well- and tight-fitted compression sleeves - before, during and after an exercise on treadmill. Methods: 14 athletes came to the laboratory three times to complete the same session with or without well- (COMP) and tight-fitted (COMP+) calf compression sleeves. The session included an incremental exercise on treadmill: 2 min at each intensity - 1, 2, 3, 4, 5, 6 and 7 km/h - each was preceded and followed by a 10-minute rest in a seated position. Calf StO2 was recorded using near infrared spectroscopy before, during and after the exercise. Results: StO2 significantly increased with COMP and COMP+ before (+ 25.2 ± 2.7 % and +22.5 ± 2.7 %) and after the exercise (+ 11.0 ± 1.5 % and +10.2 ± 1.7 %). StO2 also increased while walking but declined as the intensity progressed (+ 14.6 ± 1.9 %, +11.7 ± 1.7 %, +8.5 ± 1.8 %, +8.1 ± 1.8 %, + 5.2 ± 1.7, +3.1 ± 2.0 % and -1.3 ± 4.0 % with COMP vs. +11.3 ± 2.0 %, +8.5 ± 1.7 %, +6.0 ± 1.9 %, +5.9 ± 1.7 %, + 2.9 ± 1.6 %, -0.2 ± 2.2 % and -6.5 ± 3.6 % with COMP+). With COMP+ the significance phased out earlier (2 km/h vs. 4 km/h with COMP) and was altered at 7 km/h (while the effects were trivial with COMP). The differential was considered small compared to without (Cohen’s d = - 0.38; 95 % CI -5.46 to 4.69) and COMP (d = 0.27; 95 % CI -5.30 to 5.84). Conclusions: This study gives ground to the hypothesis that wearing calf compression sleeves may be useful during prolonged efforts involving sections of low-velocity walks (i.e. < 6 km/h such as Nordic walking or ultra-trail races), by virtue of their effect on StO2. It also appears that compression sleeves could be useful in re-oxygenating tired muscles after exercise. Finally this work provides information about the modalities for using compression garments. Indeed, using very tight-fitted compression garments may alter the hemodynamics and potentially jeopardize performances. Keywords: Tissue Oxygen Saturation; Near Infrared Spectroscopy; Compression; Walking. Compression therapy is used for the treatment of venous pathologies such as deep vein thrombosis and chronic-venous insufficiency (1). External pressure applied on the lower limbs compresses the veins, thus reducing their diameter (2). As a result, velocity increases (2), thus encouraging the return of blood to the heart and reduction of pooling (2). Many studies have demonstrated an increase in mean deep venous velocity, reduced venous pooling and an improved venous return in patients who wore graduated compression stockings (3, 4). The use of compression garments in sport is becoming increasingly popular due to claims that they can improve recovery from exercise and performance (5). Partly because of beneficial hemodynamic effects. Evidence of the efficiency of compression garments in recovery is solid with recent meta-analysis, which confirms that compression alleviates symptoms associated with fatigue (6-8). Suggested mechanisms include enhanced venous return and blood flow in passive conditions (9, 10) that may help eliminate metabolic waste (11, 12), improve muscle oxygenation (13, 14) and limit edema / inflammation (15, 16) as well as delayed onset muscle soreness (DOMS) (6, 7). These mechanisms are also used by manufacturers to justify the use of compression garments during running and cycling activities. To date though, this statement seems to be more unclear with studies both supporting (17-19) and refuting (19-21) hemodynamics effects during the effort. For example, Boucourt et al. examined the changes in tissue oxygen saturation (StO2) with calf compression sleeves (28 mmHg) during an incremental cycling exercise (3 min at each intensity - 40, 80, 120, 160 and 200 W) (19). StO2 was significantly increased at low intensities (until 80 W) but when intensities progressed (120 to 200 W), compression sleeves did not cause StO2 to change. The authors suggested that these findings could be justified by the fact that the function of calf muscle pump gets improved when effort progresses in intensity (19). Indeed, the calf muscle pump is known to increase blood velocity and therefore venous return and other hemodynamic parameters such as StO2 (2). While compression sleeves may improve the venous return when calf muscle pump is relatively inactive, they are of little interest when the calf muscle pump is already strong (19). In the same way, Ibegbuna et al. (18) also observed that wearing compression stockings (~ 20, 15 and 10 mmHg at the ankle, calf and thigh respectively) while walking at 1.0 and 2.5 km/h decreases stagnation of blood volume in the legs. But during walks at 4.3 km/h or runs at 10.1 km/h, Murthy et al. (21) reported no change in leg intramuscular pressure with elastic leggings (~ 25 mmHg at the calf). These results seem to indicate that hemodynamic effects could also occur only at very low-intensity walks / runs (17, 18, 20). Finally Maton et al. (17) showed an increase of leg intramuscular pressure with compression socks (~ 11 mmHg at the calf) at rest but also during isometric and concentric exercises (dorsal flexion of the ankle). Considering intra-muscular pressure as an index of the venous return, the authors conclude that wearing compression socks during these kinds of exercises may improve the return of blood to the heart (17). In conclusion, where the hemodynamic effects of lower-limbs compression garments in cycling seem to be verified (19), it remains less evident whether they have the same effects during walking or running. The results of the literature do suggest that hemodynamic effects could occur only during very low-velocity walks (17, 18, 21) but the level of velocity at which the effects phase out is not known. To improve our understanding of how compression garments work during activity we investigated. The first aim of the present study was to assess the changes in StO2 with calf compression sleeves before, during and after an incremental exercise on treadmill. The second aim of this study was to investigate the effects of compression garment sizing on StO2. Recent meta-analysis suggested that compression values should be taken into account when assessing the meaningfulness and practical relevance of the use of compression clothing in a given situation (5). Some studies suggest that inappropriate compression (too high / tight-fitted garment or too low / loose-fitted garment) could explain negative or no effects (5, 22, 23). For example, Sperlich et al. (2013) demonstrated that, during recovery from high intensity exercise, too high compression (i.e. 37 mmHg on the thigh) reduces blood flow both in the deep and superficial regions of muscle tissue (22). In the present study we decided to focus on StO2 because it presents the advantage of being non-invasively measured using near infrared spectroscopy (NIRS) and can be continuously recorded during the effort (unlike other hemodynamic indices such as leg intramuscular pressure or blood velocities) (19). An incremental exercise was chosen to better determine the intensity level at which the effects of compression on StO2 stop. 14 healthy athletes (no history of cardio-pulmonary disease or medication) were studied (mean ± SEM: age, 23.5 ± 0.6 years; height, 179.5 ± 1.6 cm; body mass, 73.1 ± 2.8 kg). Subjects were informed about the procedures and risks associated with participating in the study and they all provided their written informed consent prior to participation. The study protocol was approved by the local ethics committee, and was in accordance with the declaration of Helsinki of the World Medical Association with regard to research conduct. The subjects came to the laboratory three times, at the same time every day and in similar environmental conditions (temperature: 25.0 ± 1.0°C; humidity: 60 ± 1.0%), at intervals of 3 days. Each time, they completed the same session in a randomized order: without compression (control condition) and with well-fitted or tight-fitted calf compression sleeves. The session included a 14-minute test on treadmill: 2 minute at each intensity - 1, 2, 3, 4, 5, 6 and 7 km/h, preceded (baseline) and followed (recovery) by a 10-minute rest in seated position. According to the speed, subjects were asked to choose between walking and running. They were requested to maintain constant lifestyle habits during the study period (food, training load, etc. ), and intensive training and competition were prohibited during the week preceding the study and during the study period. Using NIRS technique, the InSpectra™ StO2 tissue oxygenation monitor, Model 650 (Hutchinson, MN, USA) provides continuous non-invasive assessment of StO2 at a maximum depth of 15 mm. The measurement principles of this technology have been described (24) and its accuracy and reproducibility have been previously established (24). The micro-circulatory StO2 assessment is defined as the ratio HbO2 / (HbO2 + Hb) expressed as percent, with HbO2 and Hb being oxygenated and de-oxygenated hemoglobin, respectively. The device does not directly display these values. StO2 was measured at the level of the right gastrocnemius muscle, 12 cm below the fibula head (13, 19). A transparent film was placed between the skin and the probe to protect it from sweat (24). StO2 was continually recorded during the incremental exercise and during the last minute of the baseline period and during the last minute of the recovery period. StO2 values were analyzed with StO2 Researcher’s Analysis Software Version 4 (Hutchinson, MN, USA). The device recorded one value every 2 sec. The compression sleeves used in the present study were composed of 60 % polyamide, 25 % elastane and 15 % polyester (Compressport R2, Compressport, Gland, Switzerland). Two sizes of garments were tested in this study: proper fitted (COMP) and tight fitted (COMP+). The compression sleeves were fitted to participants, using calf circumference, as per the company’s guidelines. COMP+ was considered as fitted too tight, compared to the normal recommended size. Both pairs of compression sleeves looked identical to minimize any placebo effects. The pressure applied by COMP was measured in the same area as the StO2 (gastrocnemius muscle) using the pressure device MST MK IV (Salzmann Group, St Gallen, Switzerland). COMP applied a pressure of 24.0 ± 0.8 mmHg. Then the differential in terms of pressure between COMP and COMP+ was determined using a pneumatic system (Picopress, Microlabitalia, Padoue, Italy). The pressure transducer consists of a flat plastic pressure probe (5 cm diameter) which is filled with 2 ml of air for pressure measurement. Fluctuations of pressure on this probe are transformed into electronic signals that can be recorded continuously. COMP+ applied an average pressure of 55.1 ± 26.0 % more than COMP (i.e. 37.2 ± 1.5 mmHg). Statistical analyses were performed using SigmaStat software for Windows 3.5 (Systat Software Inc., San Jose, CA, USA). Data are presented as mean ± SEM. A P value < 0.05 was considered as significant. The normality of distribution was tested using the Kolmogorov-Smirnov test. To assess the effects of the compression sleeves, StO2 was analyzed using two way repeated measures ANOVA (with or without compression sleeves x time). Fisher’s LSD test was used for post-hoc pairwise comparisons. In addition, the magnitude of the differences between each condition was calculated using Cohen’s d effect size (25). Threshold values for effect sizes statistic were < 0.2 (trivial), > 0.2 (small), > 0.5 (moderate) and > 0.8 (large). StO2 recorded at baseline is presented in Figure 1. At baseline, StO2 was significantly increased with both compression sleeves (+25.2 ± 2.7 % with COMP and +22.5 ± 2.7 % with COMP+; P < 0.05). No difference was observed between COMP and COMP+. 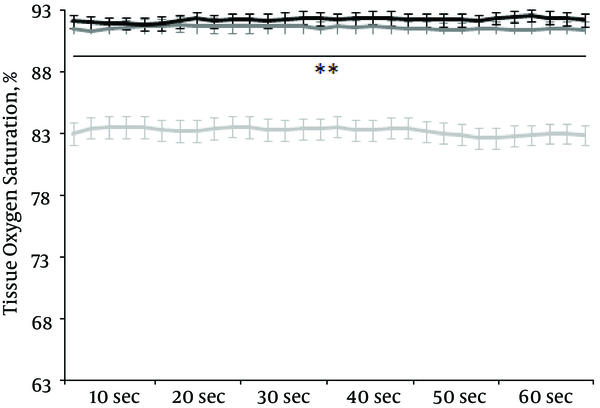 StO2 recorded during the incremental exercise on treadmill is presented in Figure 2. StO2 was significantly increased with both compression sleeves at 1 km/h (+14.6 ± 1.9 % with COMP and +11.3 ± 2.0 % with COMP+; P < 0.05) and 2 km/h (+11.7 ± 1.7 % with COMP and +8.5 ± 1.7 % with COMP+; P < 0.05). At 3 km/h and 4 km/h, StO2 was significantly increased with COMP (respectively +8.5 ± 1.8 % and +8.1 ± 1.8 %; P < 0.05) but not with COMP+ (respectively +6.0 ± 1.9 % and +5.9 ± 1.7 %). At 5 km/h (+5.2 ± 1.7 with COMP and +2.9 ± 1.6 % with COMP+), 6 km/h (+3.1 ± 2.0 % with COMP and -0.2 ± 2.2 % with COMP+) and 7 km/h (-1.3 ± 4.0 % with COMP and -6.5 ± 3.6 % with COMP+) StO2 was not significantly modified with both compression sleeves. However it is interesting to note that at 7 km/h the lowest values of StO2 were attained with COMP+ so that the differences were considered as small compared to without compression (d = - 0.38; 95 % CI -5.46 to 4.69) and COMP (d = 0.27; 95 % CI -5.30 to 5.84). All Cohen’s d effect sizes are presented in Table 1. Finally StO2 recorded during the recovery period is presented in Figure 3. During recovery, StO2 was significantly increased with both compression sleeves (+11.0 ± 1.5 % with COMP and +10.2 ± 1.7 % with COMP+; P < 0.05). Figure 1. 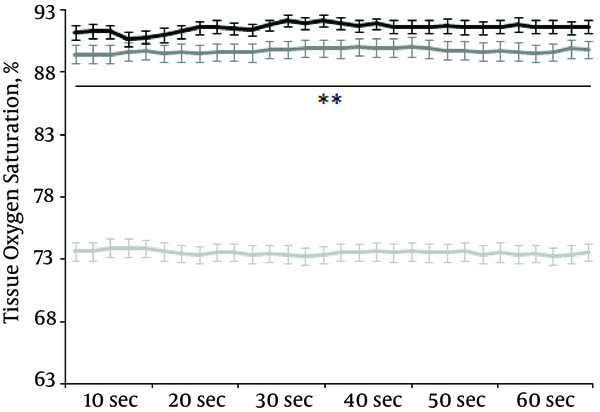 StO2 recorded without (light grey) or with well- (black) and tight-fitted (dark grey) compression sleeves during the last minutes of the 10-minute period preceding the incremental exercise (baseline). **: significantly different (COMP and COMP+) from without compression. Figure 2. StO2 recorded without (light grey) or with well- (black) and tight-fitted (dark grey) compression sleeves during the incremental exercise on treadmill. *: significantly different (COMP) from without compression. **: significantly different (COMP and COMP+) from without compression. Table 1. Between-condition differences estimated using Cohen’s d effect size (ES) analysis and 95 % confidence interval (CI). Effect sizes of 0.20 were classiﬁed as trivial, 0.20 - 0.49 were small, 0.50 - 0.79 were moderate, and 0.80 were large effects. Figure 3. StO2 recorded without (light grey) or with well- (black) and tight-fitted (dark grey) compression sleeves during the 10-minute period following the incremental exercise (recovery). **: significantly different (COMP and COMP+) from without compression. The present study aimed at investigating the changes in StO2 with calf compression sleeves - before, during and after an incremental exercise on treadmill. Several major findings have been revealed. 1) Wearing compression sleeves at rest significantly increased StO2 (baseline and recovery), whatever the size and with no difference between both (well fitted: COMP or tight-fitted: COMP+). 2) Effects on StO2 were persistent at very low-intensity walks but declined as the intensity progressed. The significance of COMP+ stopped at 2 km/h and the magnitude of the effects was considered large until 3 km/h, moderate at 4 km/h, small at 5 km/h and trivial at 6 km/h. These thresholds were delayed with COMP. Significance stopped at 4 km/h and magnitude was considered large until 4 km/h, moderate at 5 km/h, small at 6 km/h and trivial at 7 km/h. 3) Finally, StO2 was altered at 7 km/h with COMP+. Differences were considered as small compared to without compression and COMP. These results confirm our hypothesis and may be explained by several mechanisms. Firstly, StO2 increased with both pairs of calf compression sleeves at baseline (+25.2 ± 2.7 % with COMP and +22.5 ± 2.7 % with COMP+) and during the recovery period (+11.0 ± 1.5 % with COMP and +10.2 ± 1.7 % with COMP+). These results are in accordance with previous research, which reported that StO2 increased with calf compression sleeves before and after running or cycling exercises (13, 19). The higher StO2 was attributed to the increased muscle flow rate (9, 10) and changes in skin blood flow with calf compression sleeves (26, 27). Indeed, wearing compression on the lower limbs is known to increase venous return (2), causing venous pressure to decrease (1). The decline in venous pressure may increase arteriovenous pressure gradient (28), increasing arterial flow rate, oxygen supply and therefore StO2. The myogenic response may also contribute to the higher StO2 (10). As previously described (10), arterial vessels dilate in response to a decrease of the transmural vessel pressure gradient. The pressure applied by sleeves is transmitted into the tissue, thus reducing the transmural pressure gradient of the arterial vessels (29). Finally, changes in skin blood flow must also be considered (26, 27). Indeed, StO2 was recorded at a maximum depth of 15 mm including cutaneous and muscular vessels. Moreover, previous studies suggest that compression sleeves may affect cutaneous StO2 through temperature changes (13, 27) and pressure-induced skin vasodilation (26). StO2 increased at very low-intensity walking with both pairs of calf compression sleeves but it declined as the intensity progressed. Furthermore, it is important to note that effects were less pronounced with COMP+ than with COMP as indicated by effect size (+11.3 ± 2.0 % vs. + 14.6 ± 1.9 % at 1 km/h; +8.5 ± 1.7 % vs. + 11.7 ± 1.7 % at 2 km/h; +6.0 ± 1.9 % vs. +8.5 ± 1.8 % at 3 km/h; +5.9 ± 1.7 % vs. +8.1 ± 1.8 % at 4 km/h; +2.9 ± 1.6 % vs. +5.2 ± 1.7 at 5 km/h and -0.2 ± 2.2 % vs. +3.1 ± 2.0 % at 6 km/h). The significance stopped earlier with COMP+ (2 km/h vs. 4 km/h with COMP) and above all StO2 was altered at 7 km/h (-6.5 ± 3.6 % compared to without while the effects were considered as trivial with COMP). Increase of StO2 at very low intensities only is in accordance with previous studies suggesting that lower limbs compression garments could change the hemodynamic only at very low intensities (17-19). It may be mainly due to the improvement of the function of calf muscle pump when efforts progress in intensity (21). Indeed, calf muscle pump is known to increase blood velocity and therefore venous return (2). While compression sleeves may improve the venous return when calf muscle pump is relatively inactive, they are of little interest when calf muscle pump is vigorous (21). Other reasons may explain the absence of change in StO2 with calf compression sleeves, when intensities progressed. For example, increased intensities are associated with large increase in cardiac output and muscular blood flow. Therefore, it appears that, with calf compression sleeves, myogenic response is nonexistent at high intensities since vessels are already dilated (9). Many studies showed that an inappropriate compression (too high / tight-fitted garment or too low / loose-fitted garment) is often associated with negative or no effect of compression garments (5, 22, 23). In addition to Sperlich et al. (2013) who demonstrated that garments applying very high compression reduce muscle blood flow during recovery from high intensity exercise (i.e. 37 mmHg on the thigh) (22), Chatard et al. (1998) also pointed out the negative effects of compression garments (23). Indeed, wearing elastic tights during 5000 m runs altered the performances by 2.3 % corresponding to a 31-sec loss for mean performance of 1352 ± 125 sec, compared with traditional shorts. The authors assumed that the exerted pressure (i.e. ~ 30 mmHg on the calves) was sufficient to reduce blood flow and O2 transport essential to the calf muscles. The results of the present study (i.e. less pronounced effects with COMP+ than with COMP at 1 and 2 km/h, effects on StO2 stopped early with COMP+ and altered StO2 at 7 km/h) are in accordance with the findings of the literature. Tight-fitted compression sleeves cause the pressure to be higher than normal recommended-size ones and could alter blood circulation. The difference, in terms of pressure, is probably even greater as intensities progress (30). Indeed, the contraction of calf muscle is known to increase pressure under compression stockings (30). That is why we observed differences between COMP and COMP+ during effort and at rest, (baseline and recovery) when the calf muscles are inactive. At 7 km/h, which corresponds to the transition speed between walking and running, the pressure applied by COMP+ could exceed a certain level (due to the calf compression which is much more vigorous in running) and consequently cause a tourniquet effect and alter StO2. This study provides support to the hypothesis that wearing compression sleeves may be an effective strategy to alleviate symptoms associated with fatigue, by virtue of their effect on StO2 at very low intensities and at rest. First of all and as already mentioned (4, 13, 19) it appears that compression sleeves could be useful in re-oxygenating tired muscles after exercise. It also appears that wearing compression sleeves could be especially useful during prolonged efforts involving sections with low-velocity walking (< 6 km/h) such as Nordic walking, trail running and ultra-trail races. Finally, this work provides further information about the modalities for using compression sleeves during walking / running. Indeed, this study indicates that using too tight-fitted compression garments may alter the hemodynamic and therefore potentially negatively affect performances. This suggests that athletes shall wear one size above, in case of any doubts or when they feel discomfort (due to leg swelling) with well-fitted compression. In this study, the threshold at which calf compression sleeves did not change StO2 was 7 km/h. However, the generalized results should be interpreted with caution. Indeed, the exercise protocol (kind of activity, duration, etc. ), the level of weekly training of the participants or other characteristic (age for example) could move this threshold up or down. For example, it is important to emphasize that these data were obtained with healthy volunteers. Changes in StO2 could occur at higher intensities with sportsmen suffering from venous pathologies or during prolonged exercise inducing venous distension. In contrast, the threshold could occur at lower intensities if the measurements were made during climbs. Indeed, contraction of calf muscle is likely to be much more vigorous during climbs than during walks. Therefore, further studies are required to accurately identify an intensity related threshold. In conclusion, this study shows that wearing compression sleeves significantly increased tissue oxygen saturation (StO2) at rest (baseline and recovery), whatever the size and without difference between both well- (COMP) and tight-fitted (COMP+). Effects on StO2 were persistent at very low-intensity walking but declined as the intensity progressed. 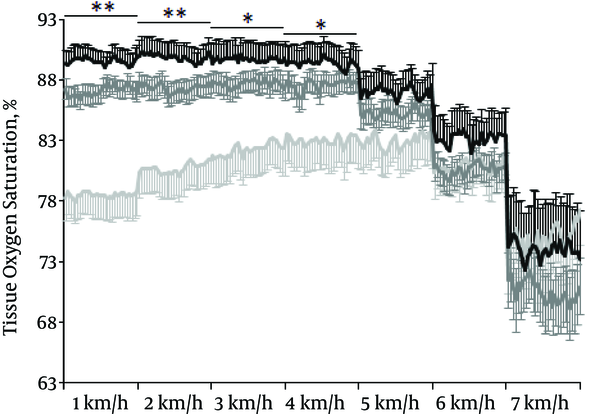 The significance of COMP+ stopped at 2 km/h whereas this threshold was delayed to 4 km/h with COMP. Finally StO2 was altered at 7 km/h with COMP+ (while Cohen’s d effect size indicated that effects were trivial with COMP). As a consequence this study supports the hypothesis that wearing calf compression sleeves (by virtue of their effect on StO2) may be useful during prolonged efforts involving low-velocity walks (i.e. such as Nordic walking or ultra-trail races). It also appears that compression could be useful in re-oxygenating tired muscles after exercise. Finally this work indicates that special attention should be given to sizing of compression sleeves since too tight-fitted compression may alter the hemodynamics and potentially jeopardize performances. The authors would like to thank the subjects for their time and enthusiasm. We also thank C. Capitan, A. Giraud Telme and Emilien, Schmitt for technical assistance and F. Ecarnot for editorial assistance. The authors disclose no conflicts of interest. Financial Disclosure: The authors thank Compressport® who provided the compression sleeves.